“Past, Present or Future” Be it whatever Binging or snacking or munching or whatever you bother to name it, is so enjoyable and might addictive too especially while watching TV or spending time with friends. We at home certainly do. The Popular brand Britannia has introduced one such munch on by the name of “Snackuits” in 3 different flavors and when Priya asked me if I could create something of it, I was so delighted to do it. Like the tag line says “Snack bhi” “Baked bhi” there is no guilt of consuming more calories when you enjoy these Snackuits. It is indeed a “Naya concept hai ji”. I preferred to keep it the way they are and both the recipes that I did uses zero oil. Now off to the recipes. Crush ½ pack of Snackuits and mix in the rest of the pack in a bowl. Add chopped onion, carrots, chick peas, sweet corn, raw mango and toss well. Arrange on a plate. Mix together tomato sauce and red chilli powder. Drop big dollops over the chaat and garnish with coriander and enjoy. Now comes the second recipe tried with a different flavor. This was yummy too. Cream together curd, red chilli powder, chaat masala powder and salt. Drop big dollops over the chaat and garnish with coriander and enjoy. Feel free to add boiled fresh peas and potatoes. You can also add pomegranate pearls and make it even tangier. If using pomegranate pearls avoid using tomato sauce. I would like to thank Priya for giving me this wonderful opportunity to make these out and share with you all. You may wish to check out on the recipes too that my fellow bloggers concocted. thx for the support & thumbs-up to the yummy recipes ! Nice dishes, both look very tempting.. I am new here…….saw your recipes, all are awesome. 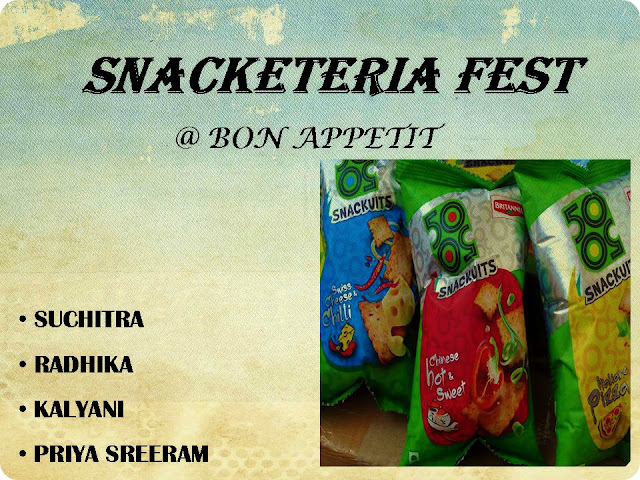 wow…very yummy n refreshing snacks…great idea Radhika!! I like how you use nice colorful cutlery Radhika.. it gives such pleasing effect to the pics..